Denman waterproof cape. Black 100% nylon with adjustable stud fastening at the back for client comfort and longer length for extra protection. Machine washable. 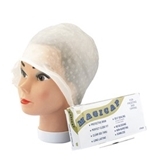 Gives protection against chemicals etc. Quality gloves with long sleeves. Available in 3 sizes and extra thick, guarantees sturdiness and re-use if required. A step forward for the hairdressing world with its spray mechanism that gives you a consistent 3 second spray with only one squeeze of the handle. Regardless of the angle you hold the bottle, it doesn't affect the performance. Lasts upto 30% longer. Ultra close fit with protective brim. Re-usable. Perfect for all high-light and low-light techniques. Includes metal needle. Ideal for adding volume, body and curl. Suitable for all types of short to medium length hair. Flexible bristles for maximum grip and control. Textured trilobal handle design for comfort during use. Quality gloves with long sleeves. Guarantees sturdiness and re-use if required. For teasing, dressing and creating up-do styles. The tree rows of stiff nylon bristles provide exceptional grip and control, which make it the ideal brush for hair extensions and wigs. This brush is also equipped with a pin tail handle. In gun metal grey with a brow comb. 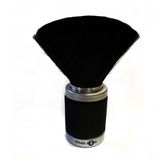 Stylish black and silver neck brush with high quality soft bristles and a rubberised handle for a better grip. Flat base able to stand on counter top. 9 Piece Carbon Comb Set. 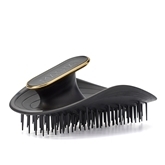 This set of Anti-Static combs includes, Plastic Tail, Metal Tail, Groomimg,Small Dressing, Large Dressing, Barbering Comb, Small Setting,5 Prong Lifter, Large Cutting. Presented in a high quality ridged wallet. Black rubber collar that creates a tight seal around the neck to prevent hair, chemicals and water entering the neckline. 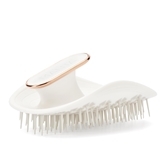 Duralon Double Tooth Detangler is a high performance comb which glides through hair to eliminate tangles. Double rows of teeth eliminate difficult knots and prevent hair from springing back and re-tangling, and the long teeth reach through even the densest of hair types.